What’s the cost of RetargetApp? Ad Spend is the amount of money spent on the RetargetApp-powered ads. You pay for Ad Spend directly to Facebook. You pay to Facebook once you spend a certain amount of money (threshold) or in the end of the month. You pay for Ad Spend even if you are on a 14-day free trial for RetargetApp. RetargetApp fee is what you pay us for running and optimizing ads for your store. You pay RetargetApp fee once your RetargetApp-powered ad spends at least 1.00 USD (or an equivalent in your currency) during the current billing period. The billing period for RetargetApp is 30 days. Up-to-date information on billing periods can be found In RetargetApp Account Settings. You start paying the fee once the 14-day free trial for RetargetApp is over. Ad Spend is calculated in USD or in equivalent in your local currency. RetargetApp fee is calculated and charged in USD only. You are charged as you reach a certain Ad Spend milestone. 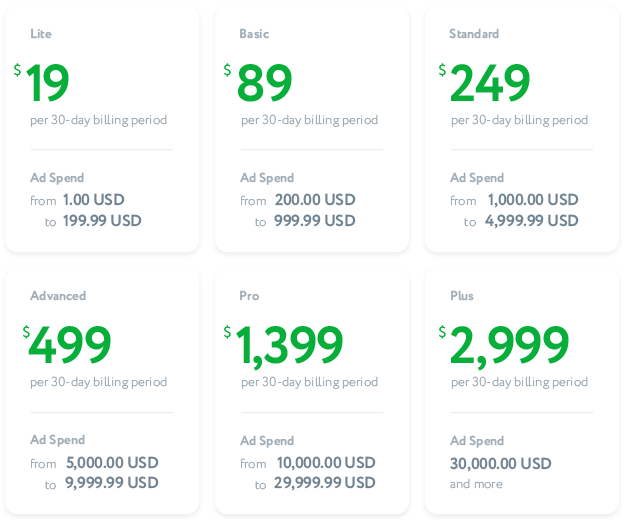 For example, your total Ad Spend during the current billing period is $800 and the total fee needs to be $89. You will first be charged $19 when your RetargetApp-powered ads spend at least $1.00 and then $70 more ($89 total charge - $19 you’ve already paid) once your campaign spends at least $200.00. If you run more than one RetargetApp-powered campaign for one store (i.e. Retargeting and Prospecting), the fee is based on total Ad Spend per one store. If you use RetargetApp on more than one store you manage, RetargetApp fee is calculated for each store separately. You can try RetargetApp for free for 14 days once you install it. Free trial suggests using RetargetApp free of charge, i.e. not having to pay RetargetApp fee. You will still need to pay for Ad Spend. The trial begins the moment your retargeting campaign spends at least 0.01 USD on Facebook. The trial ends 14 days after the moment your campaign spent its first 0.01 USD. The trial cannot be extended. Got questions or need help? Just click on the green circle in the bottom right corner of the page and message us!